Sometimes, the Hindi Film Industry produces 3 hour packages of boredom, coupled with overrated “heroes”, masquerading as “actors”. On the opposite side, it sometimes produces gems that go unappreciated. Here is my attempt to bring to light 5 such films that you’d want to watch this coming weekend. So, go on, binge ’em all. Dil Dhadakne Do is a 2015 Indian comedy-drama film directed by Zoya Akhtar, and produced by Ritesh Sidhwani and Farhan Akhtar. The film features an ensemble cast of Anil Kapoor, Shefali Shah, Priyanka Chopra, Ranveer Singh, Anushka Sharma and Farhan Akhtar, with a voice-over performance by Aamir Khan as the family dog Pluto, the narrator of the film. The supporting cast also includes Rahul Bose, Zarina Wahab, Vikrant Massey, Ridhima Sud, Pawan Chopra, Parmeet Sethi, Dolly Mattdo and Manoj Pahwa. The film tells the story of the Mehras, a dysfunctional Punjabi family who invite their family and friends on a cruise trip to celebrate the parents’ 30th wedding anniversary. The brilliance of the film lied in its realism of how Indian families function on an underlying system of patriarchy and the over-controlling aspect of parenthood. How stress runs down from a family business to the dad, to the mom, then to the children henceforth. It also showcased Anil Kapoor at his absolute best and an effortless Ranveer doing what he does best – entertain. The only reason this is the last on this list is because it wasn’t panned as badly. Yet, for the master-class that it is, it should be remembered as one of the finest film of the past 5 years. 36 China Town is a 2006 Indian comedy murder mystery film directed by Abbas-Mustan and produced by Subhash Ghai. The film stars an ensemble cast of Akshaye Khanna, Shahid Kapoor, Kareena Kapoor, Vivek Shauq, Isha Koppikar, Upen Patel (in his film debut), Paresh Rawal, Payal Rohatgi, Johnny Lever and Tanaaz Currim, while Priyanka Chopra and Tanushree Dutta make special appearances. The film follows the investigation of a police officer trying to find the killer of a wealthy casino owner, Sonia Chang. While, I’ll admit that the film is slightly ridiculous at the comical bits, but I’ve never seen a comic-thriller like this in India before. The thrill of a murder mystery, sprinkled with laughs made it a must watch deal. How it is not as popular, is beyond me. The very first time I saw the film, I was left dumbfounded. Re-watch of the same wasn’t boring either. Luck by Chance is a 2009 Indian drama film written and directed by Zoya Akhtar. Produced by Farhan Akhtar and Ritesh Sidhwani, it stars Farhan Akhtar and Konkana Sen Sharma in the lead roles. Rishi Kapoor, Alyy Khan, Dimple Kapadia, Juhi Chawla, Hrithik Roshan, Isha Sharvani, and Sanjay Kapoor feature in the supporting roles. Guest stars and industry folk starring as themselves included Shahrukh Khan, Kareena Kapoor, Karan Johar, Manish Malhotra, Ranbir Kapoor, Abhishek Bachchan, Akshaye Khanna, John Abraham, Rani Mukherjee, and Aamir Khan in seamless cameos. The film is about the journey of an actor who arrives in Mumbai to become a movie star. How he finds himself riding his fortune to becoming one, while struggling to sustain his relationships, forms the story. The film was released on 30 January 2009, supported by positive reviews from critics, but was a box office disappointment. While being Zoya Akhtar’s first, the film is an exceptional dive into the world of Bollywood or as they themselves like to call it “The Hindi Film Industry”. The film, containing the biggest names of actors from the industry, is an attempt to take a jibe at the industry itself. A must watch for anyone who is a movie-goer and especially the tabloid followers and Koffee with Karan fans. Nautanki Saala! 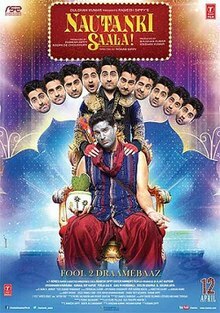 is an Indian romantic comedy-drama film directed by Rohan Sippy, starring Ayushmann Khurrana and Kunaal Roy Kapur along with Pooja Salvi, Evelyn Sharma and Gaelyn Mendonca. Why it takes up the #2 position is because it is a master-piece of cinema blending lines into theatre. The right dose of slapstick, innuendoes and just Kunaal Roy Kapur at his best. Excellent storyline of the legend Ramayana, blending itself into modern times, where the on-stage Raavan, while trying to be the off-stage Ram, ends up taking his on-stage persona to his off-stage messed up life. The lines of theatre and life blended each other, in comical situations that will make you laugh-out loud. Not everyone’s cup of tea. But for all the “draamebaaz” folks out there, this is a must-watch. Rocket Singh: Salesman of the Year is a 2009 Indian comedy-drama film directed by Shimit Amin and produced by Aditya Chopra under the Yash Raj Films banner and released in 2009, starring Ranbir Kapoor. While the film rocked solid with the critics, the box office did not reciprocate the same love and the film ultimately stalled. While the film did make ₹33 Crores on a ₹16 Crore-Budget, that is nearly what the film deserved. A masterpiece of the sales, marketing and business-based MNC culture in India, it takes a deep look into how stressing this culture is for a person who is not corrupt and with the ways of business. The film, much like the highly acclaimed TVF Pitchers, leaves you wanting to start your own start-up. However, there would have been no TVF Pitchers without this film. Also, this is the best Ranbir performance (including Rockstar and Raajneeti).